While we are aware that the Yamaha MT-15 will be launched in India in 2019, the India-spec bike has only been caught being tested in camouflage till now, and we didn't have much to go ahead on the bike's specifications and final styling. 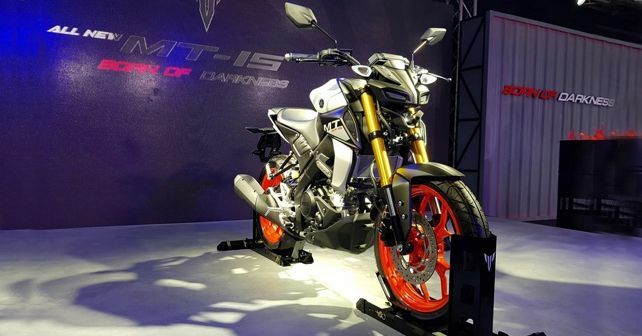 But now, the official specs of the MT-15 have surfaced online. Based on the leaked information, the MT-15 will get the same 155cc single-cylinder motor that already powers the R15 V3.0. On the MT-15, the engine is rated at 19bhp at 10,000rpm. Other details that have surfaced include the bike's dimensions, which are quite similar to the Thai-spec model. The India-spec MT-15 measures 2,020mm in length (55mm more than the Thai-spec model), 800mm in width and 1,070mm in height. The length difference between the two models could be due to a differently-designed tail section or a potentially different front-fork angle. Further, the kerb weight of the India-spec MT-15 is expected to be around the 140kg mark, similar to that of the R15 V3.0. Some changes that could be seen on the India-spec model include conventional telescopic forks (as compared to the upside-down units seen on the international model) and a standard box-type swingarm (instead of the aluminium unit of the international model). As Yamaha recently showcased the bikes to its dealers, we expect it to hit the showroom floors sometime in the first quarter of 2019.